While DreamWorks had Shrek, Pixar has Toy Story, and Illumination Entertainment has Despicable Me, Blue Sky Animation, a subdivision under 20th Century Fox, has Ice Age as their flagship series. Created back 2002, Ice Age follows the cartoon adventures of a group of animal misfits, a Mammoth, a sloth, a sabretooth, and other colorful characters throughout their time in Earth’s prehistoric era. 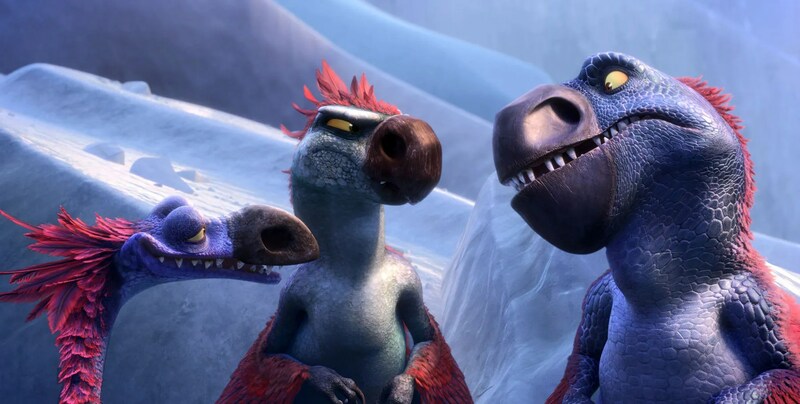 Since then, Blue Sky has churned out Ice Age sequels, furthering continuing the misadventures of our pre-historic group with the subtext names of The Meltdown, Dawn of the Dinosaurs, and Continental Drift. Each sequential installment, despite having mediocre reviews, has raked in big success at the worldwide box office. Which brings us to the year 2016, four years since the last movie was made, as Blue Sky Animation debuts the newest feature to the long-running franchise with the film Ice Age: Collision Course. Is this fifth chapter worth seeing or is it time for this franchise to go extinct? On his perpetual endeavor to protect his beloved acorn, Scrat (Chris Wedge) stumbles inside an alien ship that sends him into outer space, causing all sorts of trouble for the pre-historic squirrel, including the creation of massive asteroid hurtling towards Earth. On Earth, Manny (Ray Romano) is dealing with the maturation of his daughter Peaches (Keke Palmer), who’s fallen in love with Julian (Adam DeVine), trying to work up the nerve to her parents that she ready to roam on her own. Taking his frustrations and worries to his wife Ellie (Queen Latifah), Manny’s concerns are put on hold as panic ensues when the asteroid is spotted, sending Manny, along with friends Diego (Denis Leary), Shira (Jennifer Lopez), Crash (Sean William Scott), Eddie (Josh Peck), Sid (John Leguizamo), and Granny (Wanda Sykes), on the hunt for shelter. After meeting up with their old companion Buck (Simon Pegg), The Herd hatches a plan to thwart the asteroid from colliding with Earth, but are secretively being watched as a pack of Dromaesaurs, led by Gavin (Nick Offerman) are following them, looking to settle a score with Buck. Like I said above, the Ice Age franchise has been round the block with its features films; living through an ice age (and its melting), battling dinosaurs, exploring the continental shifts. So it’s easy to say that the franchise has been around the block (sort of) and is definitely showing its wear. Unfortunately, with its box office success growing, Blue Sky Animation doesn’t seem to be stopping making Ice Age sequels. To me, it’s been hit or miss with each movie. I liked the first movie, didn’t like the second one, liked the third one, hate the fourth one. So, at least to me, there’s a reoccurring trend with each Ice Age movie. I remember seen the trailer for Collison Course and thought it was pretty much the same thing, both good and bad. I did have low expectations for this movie, but I still wanted to see it (being a fan of animated movies). After seeing it, I believe that Ice Age: Collison Course is not the worst movie in the series, but it’s probably the more pointless one series, laughing off a wholesome story for more prehistoric cartoon comedy. Collision Course is directed by the duo Mike Thurmeier and Galen T. Chu, who have previously worked on several of the Ice Age movies as either directors or writers or animators. With both directors’ familiar with Blue Sky’s main franchise series, it’s easy for them to slide into the feature without any hesitation. Like a lot of its other sequels, the movie (as a whole) is playful, with plenty of time delegated for comedic jokes and gags. Some of the parts are pretty funny, while some might get a few chuckles here and there. So it’s a wide range from poop and “bottom” jokes to several pop culture references from today. It’s also worth-noting that Thurmeier and Chu keep Collision Course moving at a brisk pace, ensuring a breezy adventure for children, despite it being one of the longer installments of the franchise (1 hour and 34 minutes long). Visually, Collision Course’s animation, for the most part, is the same from previous installment (Continental Drift). That’s not to say that the animation is bad. What I mean to say is that animation is at the same level as it was last time I check out a Blue Sky animated movie. On the hole, it’s pretty good. There are a couple of moments that do stand out in its animation and all the colors were vibrant and bright. I did see the movie in 2D and, while its available to see in 3D, I don’t think it’s a must. The biggest problem with Collison Course is that it’s the fifth movie in its franchise. What I mean is that it’s not a problem per say, but, given its fifth entry in the on-going series, something new and refreshing needs to be presented to help preserve the story / characters in this cinematic world. Unfortunately, Collison Course doesn’t really good that, sticking towards the formula that was presented in Ice Age: The Meltdown. This means that the movie treads along the same path of familiarity from previous installments (i.e. something big happens in the beginning, then go on a journey, they discover something about their characters, etc.). It’s a tried and true formula, but, especially in Ice Age world, the previous films have covered that ground many times before. Even the film’s messages about growing up and family and forgiveness has already been done several times over in the past Ice Age films, so it makes Collision Course feel like it’s going down a sort of “check-list” from the last movie, making sure that it doesn’t miss a beat. Then there’s the story of Collision Course, which sees the gang (The Herd) trying to stop on asteroid from colliding with Earth. I mean…. really? The Ice Age movies have never been sophisticated animated movies, but it seems that the franchise is running out of ideas and basically throwing ideas at the wall and hope that it sticks. They even present the movie with featuring ancient civilizations (assuming aliens) that foretold about the coming asteroid. What? The movie even lacks heart, with several potential scenes that could’ve been developed further to create some powerful / tender moments, but forgoes that notion and goes for more nonsensical comedy gags of poop jokes and pop culture references. In short, the Ice Age movies represent the quick “cash and grab” from Hollywood today, churning out sequels that, while make money, are mediocre at best and Collison Course is just the latest example of that. Like a lot of animated movies out there, the voice talents in the film are, for the most part, solid work from a group of talented / recognizable cast of actors and actresses. Unfortunately, one of Collision Course’s problems is that there’s too many characters presented in the movie that most get shortchanged. Of course, Ray Romano and John Leguizamo are at the forefront of the main characters, returning to the roles (well voice roles) as Manny the Mammoth and Sid the Sloth. Both have always been important in the Ice Age movies and are son in Collision Course, with each one given a familiar story-arc. The same cannot be said for Diego the Sabretooth, who is voiced by Denis Leary. Leary still does a solid voice acting work with Diego, but the character is pushed to wayside with a minor subplot story with now female Sabretooth companion Shira, who is voiced by Jennifer Lopez. Like Leary, Lopez’s Shira gets lost in the sea of main characters, despite given a good voice work to her character. Queen Latifah and Keke Palmer return to voice the characters of Ellie, Manny’s wife and Peaches, Manny’s daughter. Again, both do good voice talent work, but are pushed to the back here and there for the boisterous size of the main roster of characters. In more of supporting comic relief roles are twin possums Crash and Eddie, voice by Sean William Scott and Josh Peck, and Sid’s Granny, who is voiced by comedian Wanda Sykes. All three do good in the role as their characters are, more or less, utilized for the film’s comedy. Collision Course sees the return of Dawn of the Dinosaur’s character Buck, the one-eyed adventurous Weasel, as Simon Pegg also returns to voice the eccentric prehistoric weasel. Surprisingly, Buck does get more screen (even more so than some of the central main characters), but it’s a welcomed addition (at least to me) because I always liked Buck in Dawn of the Dinosaur. As a side note, Pegg’s Buck probably as the funniest scene in all of Collision Course, doing his own rendition of the classic opera of The Barber of Seville Figaro’s Aria. Super hilarious. The film also sees new faces joining the cast (told you there was a lot) with Adam DeVine playing Julian, Peaches’s soon-to-be-husband. In terms as a character, DeVine’s Julian isn’t really anything new, but Devine does bring his vocal charm to the proceedings. Behind him is the Dromaeosaur Gavin, who is voice by Parks and Recreations’s alum Nick Offerman. Offerman’s Gavin has two children Roger and Gertie, who are voiced by Max Greenfield and Stephanie Beatriz respectfully. All three do good jobs in the roles as film’s sort of villains, despite there was plenty of room for their characters develop even more. Other additional voice work, include Modern Family star Jessie Tyler Ferguson as the yoga-loving Llama Shangri Llama, Jessie J as the female sloth Brooke, and renowned astrophysicist Neil deGrasse Tyson makes a cameo-esque appearance as Neil deBuck Weasel. Lastly, it won’t be an Ice Age movie without the inclusion of the solo misadventures of Scrat and Collision Course does have that. Just like previous installment, Scrat’s on-screen time is very much like a “Looney Tunes-esque” style with the character being tossed, crushed, flattened, squeezed and mangled in a very cartoon-ish way. It has its moments, but, much like Collision Course, Scrat’s adventure into space is nothing new and pretty much the same stuff as if even Scrat’s storyline is just going through the motions of past Ice Age iterations. Get ready to kiss your “ICE” goodbye in the newest animated sequel Ice Age: Collision Course. Directors Mike Thurmeier and Galen T. Chu’s latest installment in this on-going franchise keeps the movie light and breezy with some funny moments, excellent voice talents, and beautiful animation. Unfortunately, there’s not much to go on within this movie as Collison Course has a shell of a story, overstuffed with characters, and definitely treads into familiar territory within its own franchise. To me, I thought it was an okay movie. Isn’t not a high caliber animated movie like Zootopia or Finding Dory, but the feature gets the job done at entertaining its intended target audience. I would say that Ice Age: Collision Course is an “iffy choice” at best or possibly as a rental. It wasn’t the worst entry in the series, (I still think Continental Drift was), but you can obviously tell that the franchise has lost its vigor and overall freshness. I think the people at Blue Sky Animation need to finally close out this franchise out. It had a good run, but, just like the Earth’s actually ice age, the Ice Age franchise needs to melt away and be a memory of the past. This was just so dated.